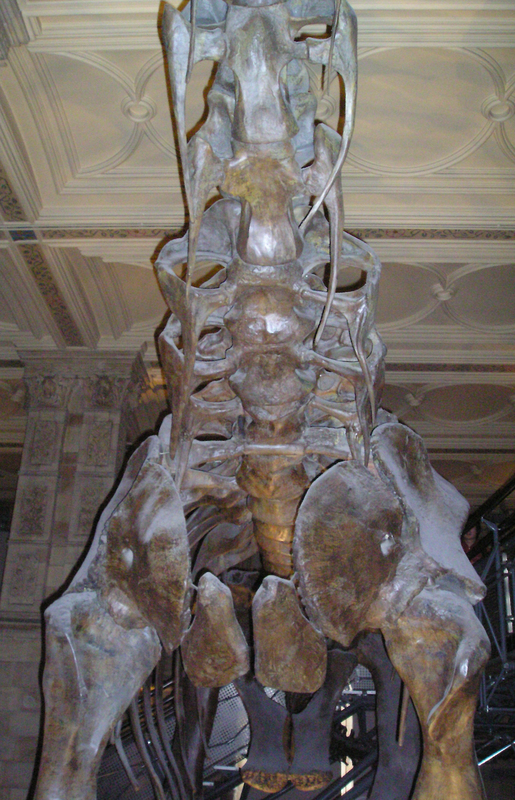 We’ve seen in previous posts here (e.g., Matt’s Russian doll post on Apatosaurus) that at least some sauropods had shockingly broad cervical vertebrae, the transverse processes and cervical ribs combining to form great ‘handles’ sweeping out laterally from the sides of the vertebrae (if you need help with those terms go to Tutorial 2). This mount is nice in showing how wide the neck base was in broad-necked taxa like Camarasaurus and Apatosaurus: rather than having subparallel lateral margins and in being narrow along its length (like a swan’s neck), the neck is damn near half the width of the thorax at its base, and then gradually tapers anteriorly. Camarasaurus cervical vertebrae are interesting in lots of other ways (did I mention the particularly large prezygapophyses and bifid neural spines? ), but that’ll do for now.